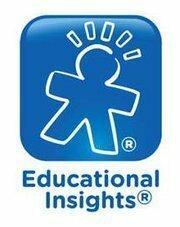 WIN a $50 Gift Certificate to Educational Insights! Who wants to win some educational toys and games for their kiddos?! Educational Insights wants to give a Family Friendly Frugality reader $50 to spend on anything in their online store! Their products are incredible, their customer service is top notch and who wouldn’t want to win $50 worth of educational products for their children? To enter, all you need to do is “like” their Facebook page. Please be sure you subscribe to Family Friendly Frugality by email as well. If you subscribe (and confirm) by email, you’ll get 10 extra entries! Be sure to keep your eyes peeled because we actually have ANOTHER Educational Insights giveaway going up shortly as well! And yes, you can enter AND win both! Let’s see how lucky you really are! This giveaway is over on 10/31/12. Entries after that time will not be counted. Winner will be chosen by random.org. This giveaway is not sponsored by Facebook. It is sponsored by Educational Insights. Your $50 Gift Card will come from Educational Insights. You have 48 hours from the time you are contacted to claim your prize. Otherwise you forfeit your prize. Disclaimer: I also will be receiving a $50 Educational Insights Gift Card for facilitating this giveaway.